We are now using a Club Membership system provided by MemberMoJo. You are able to login and manage your profile page, which has already been set up for you. You can sign in without a password if required, just your email address. However, I would recommend setting up a password for your own peace of mind. When ready, you will be transferred directly to the PayPal site to make the payment. Why not familiarise yourself with your profile page and contact us if you have any concerns or queries. Please Note: You will still have the options of paying by Cheque, BACS or Cash. Our annual membership begins 1st June, and we expect all subs to be paid by the end of June. Please do your best to pay subs on time as it is a thankless task for the Club Treasurer to chase payment at the busiest time of year for this position. (A PDF will open in a new browser window). Please print this form and complete all necessary details. Simply send to the address on the form along with a cheque for whichever subscription you choose. After a week or so, your membership card(s), plus a key will be ready to collect from the clubhouse. A £5.00 admin fee is also payable for new memberships, to cover the cost of supplying a key for the clubhouse. Please print this form and complete all necessary details. Simply send to the address on the form along with a cheque for whichever subscription you choose. There will be a charge of £5 made for issuing keys once a place has been allocated. Engine store spaces are restricted in numbers and new applications may go on a waiting list. 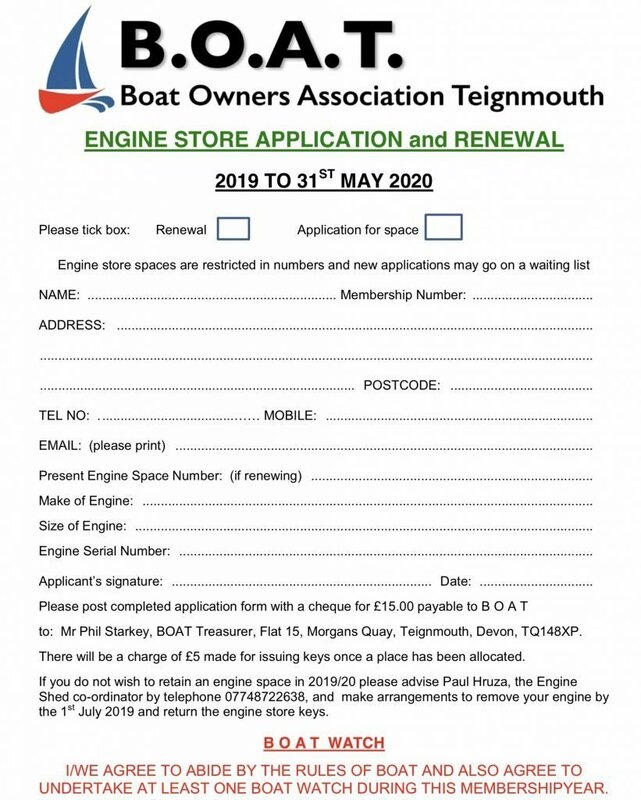 Please note: by becoming a member, you are also agreeing to undertake at least one Boat Watch during your membership year. If you have any queries about joining B.O.A.T., and it’s not convenient for you to call into the clubhouse, then please send us a message using the form below and we’ll do our best to help.